Dental implants are an advanced means of replacing missing teeth by using artificial tooth roots and a dental crown to completely re-create the function and appearance of a lost natural tooth. If you have a missing tooth, or have previously had a tooth extracted due to extensive damage, Dr. Koltun provides dental implants in Encinitas, CA to help you achieve is a smile that is aesthetically pleasing and restores the full functionality of natural teeth. The portion of a dental implant that substitutes for your natural tooth root is called the implant post, and is placed into the actual jaw bone, where your tooth root would be. As a skilled periodontist, Dr. Koltun is able to place this post right at his Encinitas office. 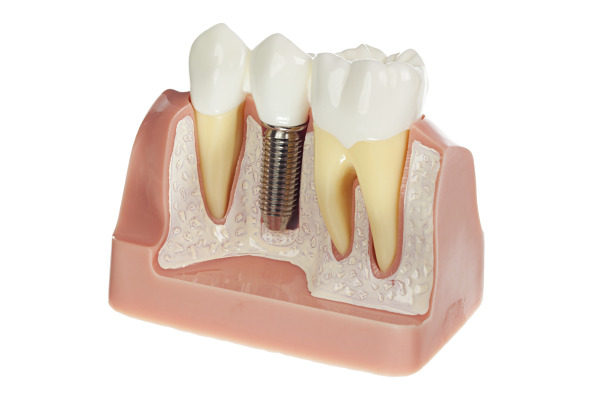 The implant post then fuses with the natural bone of your jaw to create a strong support for a natural-looking crown. Dr. Koltun brings specialized training and expertise in dealing with gum tissue and underlying bone structure -- essential knowledge for dental implant procedure. He utilizes accurate and comprehensive treatment planning information for placing your dental implants, as well as any other procedure that affects bone and gum tissue; this information aids in precisely and safely mapping out your dental implant treatment. The ideal candidate for dental implants must have an adequate amount of bone in the jaw in order to support the implant. It if the gums are not healthy or the bone density is inadequate, other dental treatments may be needed before an implant can be placed. Dr. Koltun uses a specially- designed computer program, called Simplant, to digitally format a high-resolution, 3-dimensional image of the jaw that can be viewed from any angle. This image provides accurate information to help avoid placing an implant too close to nerves or other important oral structures. CT scans produce a higher quality 3-dimensional image than traditional 2-D dental x-rays and allow Dr. Koltun to evaluate your bone quality and density, which are essential for ensuring the success of your treatment. With your implant in ideal position, your restorative dentist will be able to finalize your treatment with a custom-made dental cap. If you have any questions about dental implants, or if you are ready to make an appointment, contact Dr. Koltun’s periodontal office to learn more about getting a dental implant to replace a lost tooth.